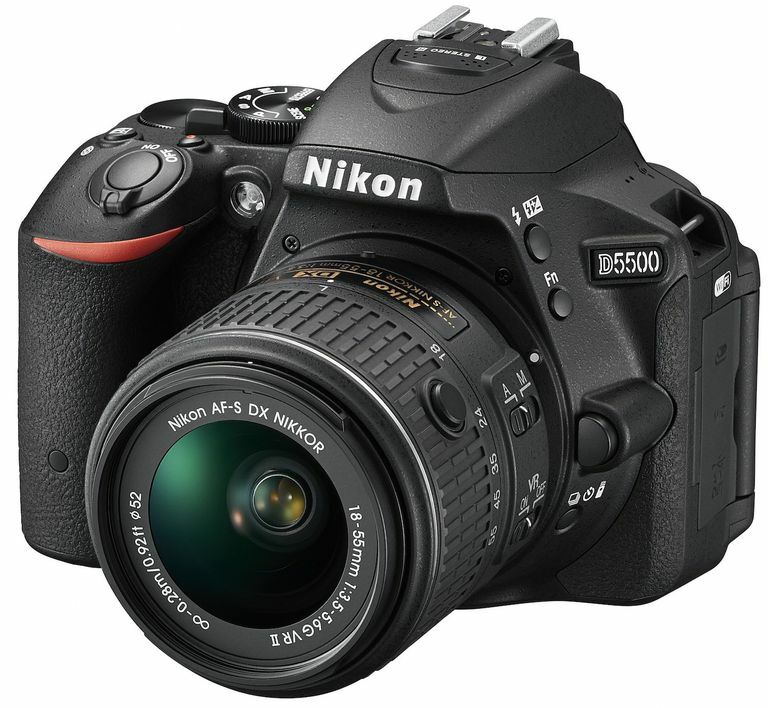 This Nikon D5500 DSLR review shows a camera that fits in the middle of the DSLR camera market. It has a nearly four-figure price tag, so it's above the price point of most entry-level DSLRs. And it doesn't quite have the image quality or performance levels you'd expect to find in a professional level DSLR. But that doesn't mean the D5500 doesn't have a place in the market. If you're a hobbyist photographer, but you find you've outgrown your entry-level DSLR, the Nikon D5500 is a great option. Its DX-sized image sensor is much larger than you'll find in most cameras (although it doesn't quite match the full frame image sensors found in professional level DSLRs). And its image quality matches what you'd expect to find with such a large image sensor, creating sharp and well-exposed images, whether you're shooting in a fully manual control mode or an automatic mode. The Nikon D5500 pros and cons include the benefit of having great battery life, a well-constructed kit lens, a sharp articulated LCD that's touch-enabled, and fast performance in viewfinder mode. The camera's downsides include an autofocus system that sometimes works a little too slowly and low light image quality that could be a little bit better. Live View performance is sluggish with the D5500 too. If you're someone who has already invested in some Nikon DSLR lenses and other accessories, because you've owned an entry-level Nikon DSLR, the ability to migrate this equipment to the D5500 helps to make this model a great value. But even if you're new to Nikon DSLR cameras, the D5500's excellent performance levels and strong image quality make it a very strong contender in the DSLR market. Image quality is outstanding with DX image sensor. With the Nikon F lens mount, you'll have access to dozens of lenses. Fast burst mode of up to 5 frames per second. Large 3.2-inch LCD screen is also articulated and touch-enabled. Autofocus can operate a little slowly in some situations. Noise is noticeable at ISOs of 3200 and higher. As with most DSLRs, D5500's performance slows noticeably in Live View mode. Camera carries an expensive starting price of nearly $1,000. The D5500's image quality is very good, offering accurate colors and proper exposure levels even in the automatic shooting modes. And you'll also have the option of adjusting the camera's settings in a fully manual mode to achieve the best results in a tricky shooting situation. You'll have the option of shooting in either the RAW image format or JPEG with the Nikon D5500. The camera's performance will slow a bit when you're shooting in RAW versus JPEG, but that's common with DSLR cameras. When shooting in low light, Nikon included a popup flash unit with this model, which is convenient to use when you're shooting in a hurry and don't want to fumble with an external flash unit. But you also can add an external flash to the D5500's hot shoe for more control and power from the flash unit. If you choose to go without a flash, you can increase the ISO setting to around 3200 before you begin to notice noise in the photos, which isn't quite as good as some other Nikon DSLR models. The Nikon D5500 video quality is very good. DSLR cameras struggled several years ago with video recording quality and features, but the newer models do a nice job with video, and the D5500 fits with that mode. You can shoot at speeds up to 60 frames per second in full HD resolution. And Nikon gave the D5500 a dedicated video recording button, which makes shooting movies a snap. Nikon made the D5500 a lot of fun to use by including numerous special effect options. Having a good set of automatic shooting modes and numerous special effects should make the D5500 easier to use for those who may be migrating from a point and shoot camera to a DSLR. Nikon gave the D5500 a very high-quality LCD screen, measuring 3.2 inches diagonally, which makes this model one of the best large LCD screen cameras around. It has more than 1 million pixels of resolution, making it a clear and sharp display screen. You also can tilt or rotate the LCD to give you a better option for shooting odd angle photos or for using the Nikon D5500 while attached to a tripod. And the D5500 is a best touchscreen LCD camera, which is a nice bonus, as being touch enabled isn't common among DSLR cameras. You also have access to a viewfinder with this model, and the D5500 will perform with the best speed when making use of the viewfinder to frame photos. If you use the LCD to frame photos — called Live View mode — the camera's performance will slow noticeably. You should be able to shoot your first photo just a little more than 1 second after pressing the power button, which gives the Nikon D5500 great responsiveness. It has a maximum burst mode setting of about 5 frames per second, which should be fast enough for most sports photography for an intermediate level photographer. This level of burst performance matches that of the more expensive Nikon D810. The camera's design is very good, as is the case with most of the best Nikon DSLR cameras. The right-hand grip is comfortable to use, and the buttons are easy to reach while you're using the camera naturally. The D5500 only weighs a little more than 1 pound for the camera body alone, which is less than most DSLR cameras. Nikon included built-in Wi-Fi with the D5500, which allows you to share images with other people after you shoot them. And if you download the Nikon app to your smartphone, you should be able to control some of the DSLR's settings remotely. With the F lens mount on the Nikon D5500, you can pick from dozens of lenses to use with this camera, which gives it great versatility. The D5500 often does ship with an 18-55mm kit lens, as did the test unit for this review, and this kit lens performs much better than expected. Having a high-quality kit lens helps to justify the nearly $1,000 price point of this model with its starter lens, so this is a nice inclusion on the part of Nikon.